Commission calculation for benefits brokers can be complex. You work with multiple insurance carriers and each of them pays a commission. The payment is then split between the agency and the producer. But then it starts to get interesting and oftentimes unmanageable. 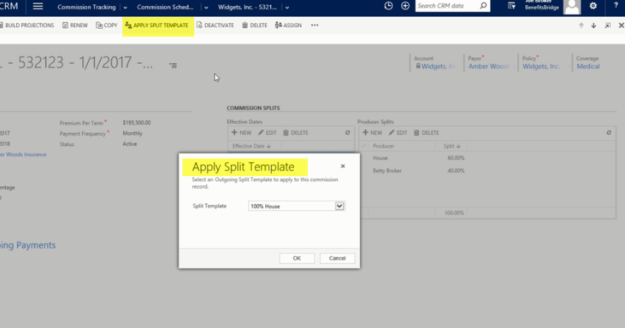 The amount paid and the split percentage can be based on many variables such as the specific policy sold, the type of policy, the policy period, and policy terms. Most out of the box software systems have a hard time dealing with this level of complexity. 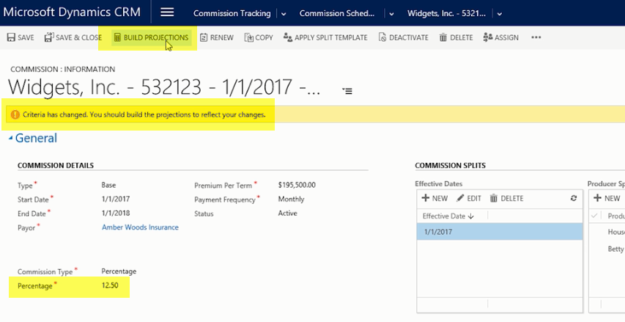 The commission tracking module within Crowe BenefitsBridge for Microsoft Dynamics 365 was designed specifically for the unique needs of the employee benefits broker industry. 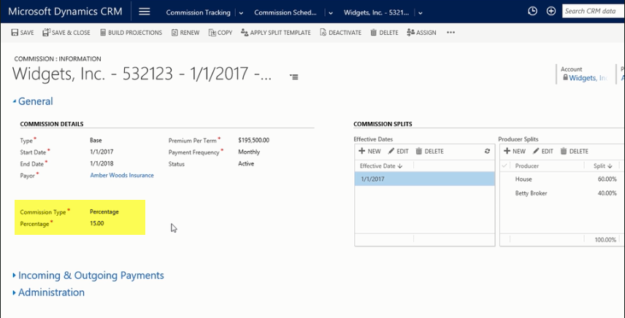 Here are a few examples of how you can simplify this complex commission calculation task. In Crowe BenefitsBridge you can view all the commission schedules that are associated with a specific policy. 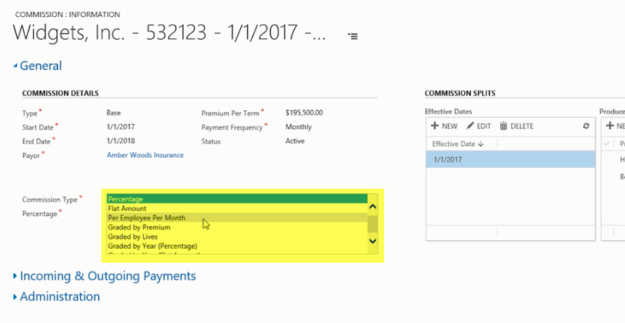 You can see the details of the commission schedule including the effective date, total premium, how often you will be getting paid, and how your commission will be calculated. 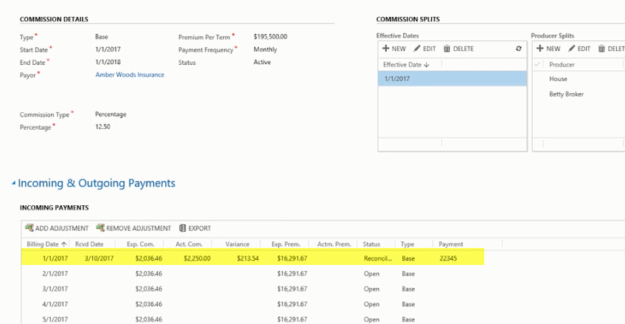 In this example, the screen shows that you are getting paid 15% commission. 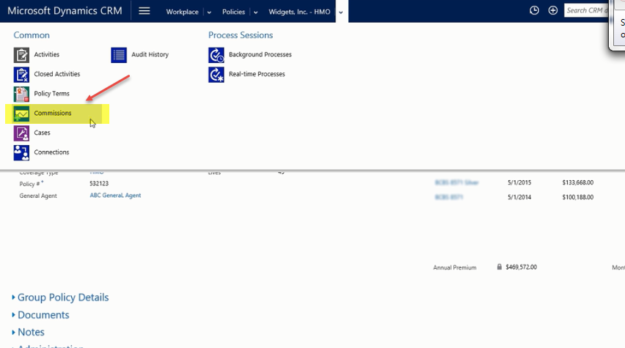 You are also able to select other ways to calculate the commissions, such as a flat amount for an employee per month, and several aggregated schedules, which allow you to specify different percentages or dollar amounts, based on the premium, covered lives, or on how long the policy has been in effect. All this information details your expected incoming commission payments, commissions that you expect to receive from the insurance carrier. Next you need to detail how you are going to distribute the commission payment. In this example, the house will receive 60% of the commission payment. 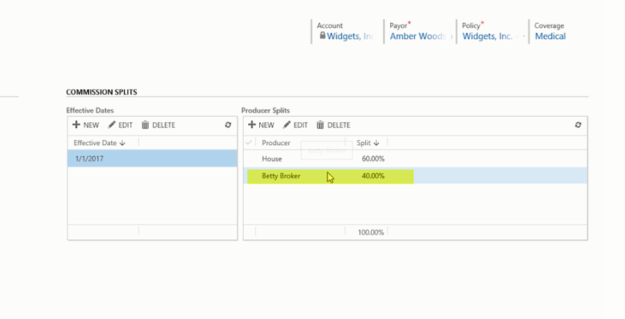 One of your producers, Betty Broker, will receive 40%. You could break this down in any number of ways. You can also apply a split template, if you use the same splits for many different schedules. Based on this information Crowe BenefitsBridge is able to automatically create your expected commission payment schedule. The incoming payment's grid shows you every payment you are expecting to receive for the life of the schedule, along with the expected commission amount. The outgoing payment's grid shows you how each of those incoming payments will be distributed, based on an expected commission amount. 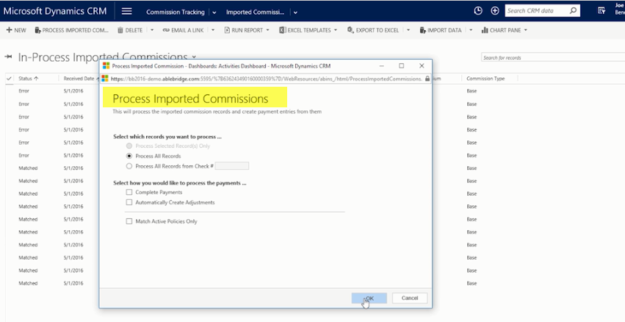 If necessary, you can easily change the commission percentage you are receiving. When you do that, Crowe BenefitsBridge will let you know that the projected incoming payments are not accurate, and you should update them. You can do that by clicking the "Build Projections" button. 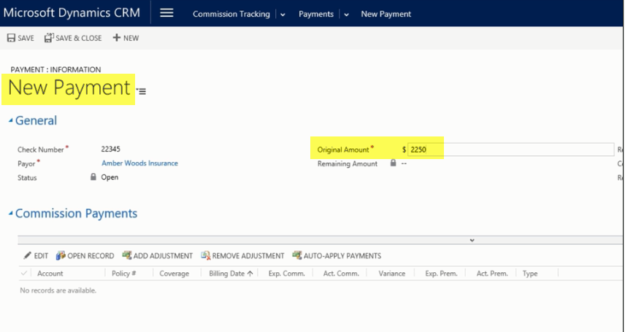 This will update both the incoming and outgoing payments to reflect any changes you made to the commission percentage. Let's fast forward to when you receive your first commission payment from the carrier. You want to track that in Crowe BenefitsBridge and apply the payment to the correct policies. 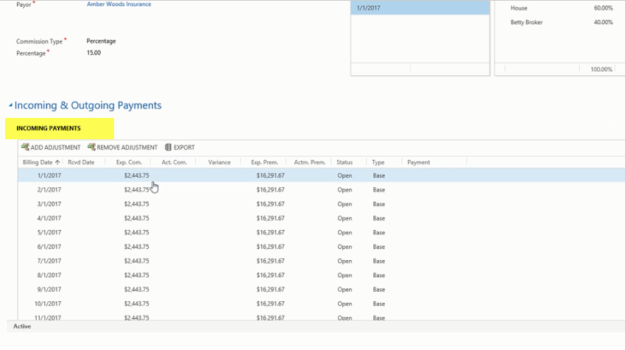 In the Payments screen you can enter the basic information about the payment received, such as the date, payer, and amount. 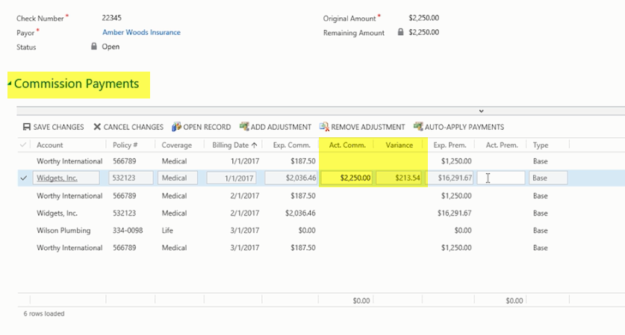 Crowe BenefitsBridge shows you all open incoming payments that match the payer and date information you specified. You can find the entry that this commission payment was for, and apply the amount paid directly into the grid. Crowe BenefitsBridge calculates the difference between the actual commission payment and what we expected to receive. In this example you received more than you expected. You can also track the actual premium the commission was paid against. If you received a payment that was for multiple policies, you could easily apply the money across different incoming payments. 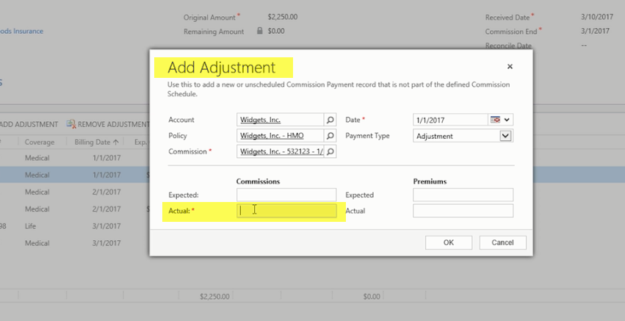 If you received an unscheduled payment for a policy, one that wasn't part of your commission schedule, such as a bonus or adjustment, you can use the "add adjustment" button to add it to the commission schedule. When you finalize the payment as complete, you only see the incoming payments you actually applied money to. If you go back to the original commission schedule view you can see that the first payment has been received and applied. Under outgoing payments, you can see the actual payment that Betty Broker and the house will receive. This method of applying payments is great on a small scale. If you want to apply many payments at a time, you can use the Crowe BenefitsBridge Commission Payment Import feature. Here you can upload a spreadsheet to Crowe BenefitsBridge and let it do the work of matching and applying each payment. Crowe BenefitsBridge will automatically match your imported statement to the correct policy and billing date, and let you know if there are any payments that can't be automatically matched. You are provided with detailed information to easily identify how to match these specific payments manually. 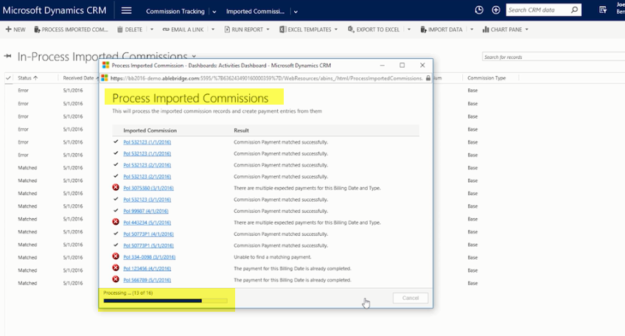 Tracking commissions is often a time consuming process that can be overwhelming every month. The Commission Tracking Module automates these processes and is designed to save employee benefit brokers significant time and money. A complex process that would normally take a week is slimmed down to a matter of hours. Brokers are happy because they get their commissions faster, the finance person in charge of the calculations can focus on more important tasks and management has accurate reports and projections. 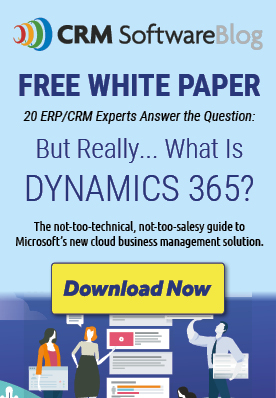 And it works right inside your existing Microsoft Dynamics 365 system. If you are interested in evaluating Crowe BenefitsBridge for Microsoft Dynamics 365 contact us today. Email vs Excel vs MS Project vs CRM – What is the Best Project Management Tool?